ANA are substances produced by the immune system that attack the body's own tissues. The screening test determines whether such antibodies are present. The test also measures the level, called the titer, and the pattern, which can be helpful. If the test is positive, a panel of tests may be done to identify specific antigen targets. This is the ANA antibody panel. Blood is drawn from a vein. Most often, a vein on the inside of the elbow or the back of the hand is used. The site is cleaned with germ-killing medicine (antiseptic). The health care provider wraps an elastic band around the upper arm to apply pressure to the area and make the vein swell with blood. Next, the provider gently inserts a needle into the vein. 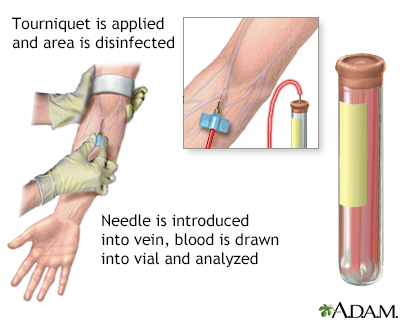 The blood collects into an airtight vial or tube attached to the needle. The elastic band is removed from your arm. No special preparation is needed. However, certain drugs, including birth control pills, procainamide, and thiazide diurectics, affect the accuracy of this test. Make sure your provider knows about all the medicines you take. When the needle is inserted to draw blood, some people feel moderate pain. Others may feel only a prick or stinging sensation. Afterward, there may be some throbbing. You may need this test if you have signs of an autoimmune disorder, particularly systemic lupus erythematosus. This test may be done if you have unexplained symptoms such as arthritis, rashes, or chest pain. Some normal people have a low level of ANA. Thus, the presence of a low level of ANA is not always abnormal. ANA is reported as a "titer". Low titers are in the range of 1:40 to 1:60. A positive ANA test is of much more importance if you also have antibodies against the double-stranded form of DNA. The presence of ANA does not confirm a diagnosis of systemic lupus erythematosus (SLE). However, a lack of ANA makes that diagnosis much less likely. Although ANA are most often identified with SLE, a positive ANA test can also be a sign of other autoimmune diseases. Normal value ranges may vary slightly among different laboratories. Talk to your provider about the meaning of your specific test results. Further tests can be run on blood with a positive ANA test to get more information. To make the diagnosis of SLE, certain clinical features as well as ANA must be present. In addition, certain specific ANA antibodies help to confirm the diagnosis. Veins and arteries vary in size from one person to another, and from one side of the body to the other. Obtaining blood from some people may be more difficult than from others. Your provider will use the results of the ANA panel to help make a diagnosis. The tests alone however do not make a diagnosis, but must be used along with your medical history, physical exam and other tests. The ANA can be positive in relatives of people with SLE who do not have SLE themselves. There is a very low chance of developing SLE at some time later in life if the only finding is a low titer of ANA. Alberto von Muhlen C, Fritzler MJ, Chan EKL. Clinical and laboratory evaluation of systemic rheumatic diseases. In: McPherson RA, Pincus MR, eds. Henry's Clinical Diagnosis and Management by Laboratory Methods. 23rd ed. St Louis, MO: Elsevier; 2017:chap 52. American College of Rheumatology. Antinuclear antibodies (ANA). Updated June 2015. www.rheumatology.org/I-Am-A/Patient-Caregiver/Diseases-Conditions/Antinuclear-Antibodies-ANA. Accessed April 03, 2017.